Have you seen/met David Bowie before? Where and when was it you met him? no I'm just 16 so I was too young to see him when he did the reality tour :S I REALLY hope I'll get a chance to see him! Actually I think we are almost more people here which are in our age... ALMOST He's really not one of those old singers who only have the same old fans as when they were 20! Did he ever come to Canada? I hope someday I will see him! I wish I was able to go and see him, I wasn't born until 1992, so most of the shows I wasn't born, and the others I was too young to go. First seen Bowie in 1973 (I was 15) when he did his legendary 'Ziggy Stardust Tour'. This was at Coventry Theatre, England (my home city). I had been into Bowie since 1971 and the show literally blew me away! Nothing like that had ever been seen before - the line-up: Mick Ronson guitar (brilliant), Trevor Bolder bass, Woody Woodmansey drums and Mike Garson piano (the Aladdin Sane piano solo was unreal). I next saw him in 1976 at the Wembley Arena in London England. This was his 'Thin White Duke Tour' around the time of the Station to Station Album, and just after his starring role in the film 'The man Who Fell to Earth'. He was stick thin and gaunt, probably due to the copious amounts of drugs he was doing at the time. It was a great show though. My abiding memory was the sickly sweet smell that pervaded the arena when the lights went down and the show began - it was of course, everybody spliffing up! But I was a naive lad at the time. A few years passed (by this time I was married) and we saw him at the Milton Keynes Bowl, England in 1983. This was his 'Serious Moonlight Tour'. It was all a bit too 'showbizzy' for me, but he put on a good set. I think that show was best viewed on the released DVD of the same name. 3 years later I saw him at Wembley Stadium, London England. It was 1987. I was with a bunch of mates and we were pretty much drunk by the time we got to London! We were stuck at the back of the huge stadium and had to rely on the crappy plasma screens. It was by his own admission, way over the top, in terms of production. This is what led him on to form Tin machine (the most underrated albums of Bowie's work). Finally (by this time my we had our first child) I saw him at the national Exhibition Center, Birmingham, England in 1990. He called it his 'Sound+Vision Tour'. It was a stripped down set with a 4 man backing band - Adrian Bewley was brilliantly mad on guitar. The backdrop was a giant screen with choreographed sequences synced to his live performance. It must have been 60 feet high at least! Most of the scenes featured The Canadian La La La Human Steps dance troupe - it was amazing, and I was only 4 rows from the front of the stage! That was the last time! I fear he will never do another major world tour. He is not in the best of health and his voice seems to have degraded (unthinkable! I know!) I hope I am proved wrong though. He really is a true living legend, and his music has been part of the fabric of my life. I would give anything to see him live just one time. Damn, you saw Ziggy Stardust and the Thin White Duke. I'm really jealous. Looking back...yep, I guess I was lucky to be around during what was probably the most creative part of his career. I was 14 (put an extra year on myself in my original post!) and sure, it was mind-blowing, like I said. But it only really sunk in a couple of years later that I had probably witnessed one of rock & rolls most iconic incarnations that was Ziggy Stardust! I really appreciated 1976! I bet he was great to see live all those times! I do hope he comes back, so I can see him live, however if it would be bad for his health, I understand. you are so lucky! when i think that i should have seen a concert of the reality tour here in Italy and i haven't i feel very sad... but anyway i was really young, so also if i loved him very much probably i couldnt really appreciate him... but i feel sad anyway! i hope very much to have the opportunity to see him! I hope I get a chance before he', y'know, which is impossible because dude's the ageless god of rock. Oh, Lord...after reading a little bit more here inside the forum I feel like a dinosaur! Seems to me that I'm really one of the elder ones here only beaten by one guy who had the chance to see David playing in the 70ies during his TWD-period! This record was "The Rise and Fall of Ziggy Stardust..." and I absolutely loved it! At that time there where other bands out there such as Duran Duran, Kajagoogoo, Simply Red, Boy George and Culture Club etc. - David was just so different! It seems to me that I actually felt in love with him when I first listened to "Moonage Daydream"! The there was the "Serious Moonlight-Tour" and all that Media-Hype in '83. For me it was the beginning of my long-live-love to David and the beginning of collecting nearly everything I could find or get of him. All these posters, LP's, Books and all that memorabillia that you collect when you become truely obsessed about somebody...You could see no more wallpaper in my room because everything was so fully covered with David! And you younger ones: Don't mind if you have argues because of him; there will always be a few not open minded people who will never ever understand or even imagine what David Bowie did to the music of our time! 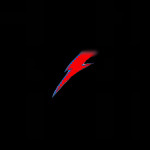 Bands like Placebo, Nirvana, U2, Nine Inch Nails would have never ever been able to record only one note without a David Bowie! He had influenced soooo many bands, musicians, singer/songwriters and not just with his music but also with his style, his outlook and even with his hairdo! So just keep on smiling and keep in mind that YOU know it better! But, back to topic. So, my first concert was on the 6th of June in 1987 in Berlin, at the Reichstag, the Wall was still standing and it was something I will never ever forget! I also had the chance to listen to the Soundcheck that he and the Band made in the afternoon and there he played "All the Madmen" only for a few of us! You can watch the videos on youtube, but you won't have no chance of timetravelling and be a witness of that, ha! Me and my best friend became real followers of David from that day on and so we saw him in Hamburg, Nürnberg, Stuttgart and Vienna that year and we also had the chance to meet him outside of his Hotel in Vienna where he stayed and say "Hello" to him the first time! He was so gentle, so sympathic and so open-hearted - I would have never ever imagined! For me a dream came true and the only thing I really can remember of that first time of meeting him was that he was sooo small and sooo thin! He's just 1,72 cm - well maybe not anymore . After "The Glass-Spider-Tour" it was up to the Tin Machine-Gigs in Hamburg and Amsterdam on the first tour and then on the "It's my life-Tour", the second part with the second Album it was up to Berlin, München. Stuttgart, Hamburg and Hannover to see him playing with TM. In each and every city we tried to find out in what Hotel he was and often we had the chance to see him checking in or leaving for show and coming in again late in the night. So we used to stay there and aks for autographs or just to make some pictures or to say "Hello!". Well, in the night we sat together in the lobby of the "Kempinski" just beneath David and Coco and the rest of the crew and then it was all worth it!!! We had red-whine and David drank Gin-pure-on-the-rocks! Later there was the Outside-Tour to come and we've been in Dortmund, Hamburg, Frankfurt and Berlin. I just missed the Earthling-Tour. Dunno know exactly why. I had a lot of personal things and trouble during that time, I'm allready 39 years old now, I have a grown-up son aged 18, had lost my husband in 1997. So, there where no good times. And no times to visit David on Tour. But I had the chance to see him during "Wetten, daß...?" which is a big saturday-evening show here on german television and the recorded in in Münster/Germany. So, the last time I've seen David was on the "Reality-Show" in 2003 in Cologne. Only one time, only one show. Well, must have been my age, ha? Times of travelling are over. I'm just no young teenager anymore and I must say to my shame that I had a few years where my passion for David hasn't been THAT strong. But: those days are over! With youtube and a lot of fanpages - including this forum here - it all came back and today I'm into it again collecting just each and every picture or interview on the internet that I can find. So, I hope no one has fallen asleep while reading this and that you may have enjoyed some of the memories I shared with you! All the best and greetings from Germany to all of you! Well, good to have you onbard, girl! Subject: Re: Have you met or seen David Bowie?